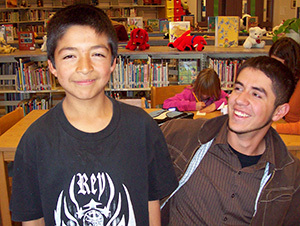 “Arizona Children of Incarcerated Parents Bill of Rights Project Report” (2007). Describes overall project and recommendations. Pima Prevention Partnership provided quantitative and qualitative data at local, state, and national levels which informed the initiative. “Arizona Children of Incarcerated Parents Bill of Rights Project Manual of Strategies” (2007). Highlights policies, practices and programs that are currently being implemented across the U.S. to benefit children affected by parental arrest and incarceration. “Children of Incarcerated Parents: Research and Resources” in Children’s Bureau Express (February, 2004, Vol. 5, No. 1) by Administration for Children and Families, US Department of Health and Human Services. “Cradle to Prison Pipeline” (2006) by Children’s Defense Fund, Washington, DC. Report documents impact of poverty and race on rate of incarceration in America. “Making a Difference: An Impact Study of Big Brothers Big Sisters”, a 1995 publication of Public/Private Ventures Research, identified many positive effects of Big Brothers Big Sisters mentoring matches. BBBS agencies have been national leaders in mentoring for over 50 years and are considered to provide a best practice intervention. The Open Society Institute of the Soros Foundation funded a Senior Fellow to provide technical assistance to groups across the country that were interested in pursuing changes in policy and practice to make The Bill of Rights for Children of Incarcerated Parents a reality. These groups – or partnerships as they refer to themselves – did not receive any funding, only technical assistance. Nonetheless, in the course of 14 months members of the partnerships formed organizations, educated themselves about issues affecting children with incarcerated parents, mobilized support, and launched a multitude of projects to change how systems and programs interact with children whose parents are in jail or prison. These partnerships show the potential of becoming a potent incubator for policy and practice reforms. Attention to the issues faced by children and families of incarcerated parents (CFIP) has grown over the last few years both nationally and in Washington State. In the State of Washington alone, it is estimated that there are nearly 30,000 children who currently have incarcerated parents. Many of the issues addressed by other states are the central issues that have arisen thus far in Washington State. These include visitation and contact, maintenance of safety for the child and caretaker, systems collaboration in addressing the needs of children at time of arrest, relevant services for parents while incarcerated, proximity of parents to children and establishment of family friendly visitation policies, collaboration between corrections and child welfare, maintenance of income and other supports for caregivers, management of child support and other debt by parents exiting incarceration, expansion of community and agency supports and services for children, and appropriate sharing of data and information to allow cross-agency collaboration. To analyze these and related issues, Washington State passed HB 1426 in 2005, which led to the creation of the Final Report of the Oversight Committee in 2006. This report recommended several changes to policies and services. Thirteen programs around the country were funded in 2006 under the U.S. Department of Health and Human Services' (HHS) Responsible Fatherhood, Marriage, and Family Strengthening Grants for Incarcerated and Re-entering Fathers and Their Partners (MFS-IP) grant program. State, local, and Tribal agencies and private community and faith-based organizations are using the funds to develop services that promote healthy relationships for couples with children, where one parent is (or recently was) incarcerated. A new report presents the first results of a 7-year evaluation of the MFS-IP grantees that began in October 2006. Focusing on the evaluation design, this study describes all 13 projects along a variety of dimensions and describes the evaluation framework that will be used in upcoming reports. This framework will assess the inputs (e.g., funding, partnerships),"throughputs" (e.g., services), outputs (e.g., systems change), and outcomes (e.g., child well-being, family violence) of the project. The brief was prepared by Christine Lindquist and Anupa Bir of RTI International, under contract to the HHS Office of the Assistant Secretary for Planning and Evaluation (ASPE), and is available on the ASPE website. WASHINGTON – Presents data from the 2004 Survey of Inmates in State and Federal Correctional Facilities about inmates who were parents and their minor children. This report compares estimates of the number of incarcerated parents and their children under the age of 18, by gender, age, race, and Hispanic origin in state and federal prisons in 1991, 1997, 1999, 2004, and 2007. It presents the total number of children who were minors at some time during their parent’s incarceration. The report describes selected background characteristics of parents in prisons, including marital status, citizenship, education, offense type, criminal history, employment, prior experiences of homelessness, drug and alcohol involvement, mental health, and physical and sexual abuse. It provides family background of inmate parents including household makeup, public assistance received by household, drug and alcohol use, and incarceration of family members. It includes information on the children’s daily care, financial support, current caregivers, and frequency and type of contact with incarcerated parents. The nation’s prisons held approximately 744,200 fathers and 65,600 mothers at midyear 2007. Parents held in the nation’s prisons—52% of state inmates and 63% of federal inmates—reported having an estimated 1,706,600 minor children, accounting for 2.3% of the U.S. resident population under age 18. Growth in the number of parents held in state and federal prisons was outpaced by the growth in the nation’s prison population between 1991 and midyear 2007. The report, Parents in Prison and Their Minor Children (NCJ 222984), was written by BJS statisticians Lauren E. Glaze and Laura M. Maruschak. The report can be found at http://www.ojp.usdoj.gov/bjs/abstract/pptmc.htm.